"Hotel Gracery " aims to become a hotel which can offer beautiful sightseeing and great leisure to its guests by offering tourist information at hotel lobby. We are accelerating the opening of stores, not only in Japan but also overseas. · Hotel Front, Concierge ... Handle customers' check-in and check-out procedure, respond customers' requests, provide customers information. · Reservation ....Handle telephone bookings, e-mail bookings from customers, as well as bookings from travel agencies, booking sites, sales offices. · Restaurant..... Serving customers breakfast, the most important beginning of a day, in restaurant. We are looking for those who would love interacting with others, those who are active , those who has leadership and ambition to make a great hotel, and those who would like to challenge in newly opening hotels. At our company, comtract employees belonging to each different hotels, which means there will be no job transfers ( inside area). If you work with us for more than one year, you are eligible to apply for our permanent employement system. After passing our screenings, you will become our permanent employee. Details will be explained once you visit our booth. The hotel industry is a workplace where you can fully utilize language skills and knowledge that you have cultivated so far, your interpersonal skills will also be improved more. 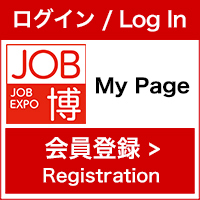 With the opening of new hotels in Japan and Asia and the increase in foreign tourists visiting Japan, we are actively recruiting foreign staffs. Now, we have many foreign staffs working at WHG hotel around the world.